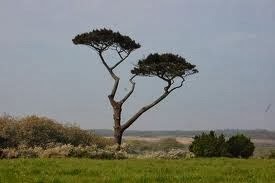 The Font of Knowledge: A forest of these trees is a spectacle too much for one man to see. 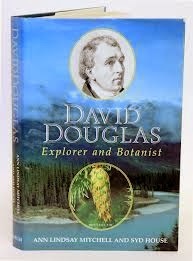 David Douglas – Explorer and Botanist. Ann Lindsay Mitchell and Syd House. Aurum Press, London, 1999. pp X1V + 241. In 1974 I acquired 40 acres of fairly rough farming land as part of a summer home for my growing children. Family circumstances prevented me from proceeding with our plans and I planted 30 acres of Sitka, Japanese larch and Monterey pine rather than adding farming to my medical profession. This endeavour was to prompt a great interest in trees. After my later retirement I became active as a member of the Irish Tree Society, a representative of an Taisce on the Irish Tree Council and, among other arboreal interests, I wrote a book about the relationship between ivy and our hedgerow and woodland trees. This biography was largely based on diaries and letters Davis Douglas had sent to Britain during his various travels to the North American continent and to Hawaii. Douglas was born in Scotland of humble parents but was possessed of an extraordinary enquiring mind, particularly in relation to natural history. He became one of the most famous and adventurous of the large group of Scots who contributed so much to the exploration of the natural world. He had an obsessive interest in plants and trees and was fortunate to have been employed by prominent horticularists and botanists from the time he left school. He died tragically in 1834 at the age of 35 but during his short life and his three visits to America he provided an enormous amount of information about the plants and trees of the United States and the contiguous parts of Western Canada. He contributed his findings to the Historical Society in London which employed him during his travels. Because of his systematic and enquiring mind and his indifference to hardship and the dangers of exploring unknown and hostile territory, he proved to be an excellent choice by the Society and acquired an early reputation as an explorer, traveller, botanist, student of natural history and a diplomat and linguist who could deal with the most hostile and isolated indigenous tribes. Leaving London in July 1823 he first went to New York where he collected valuable information about the trees and plants of the area. Having returned from New York he put his collection of seeds and plants in order and wrote up the details of his travels. He was then sent to the largely unexplored west coast of North America where, after spending eight months rounding the Horn, he landed at the mouth of the Columbia River in what is now the State of Oregon. It was here that he accomplished his remarkable work into the local flora. He managed to send by various routes details of his huge collection of seeds and seedlings to London. They were based on his discoveries, the product of which now adorn our gardens, estates and arboreta. 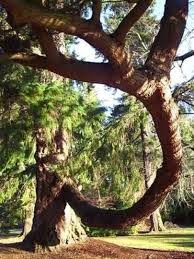 They include a variety of sequoias, the Monterey pine, the Sitka spruce and the rediscovery of a few others. Another addition to fashionable tree lovers in the 19th century, the monkey puzzle tree, was discovered by an earlier explorer in the late 1700s in Chile. It is difficult to understand the toleration to hardship endured by explorers like Douglas during long sea voyages and travelling through wild and dangerous country without any of the modern comforts and conveniences which make travel nowadays so much easier. 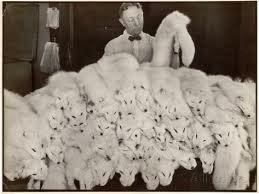 A man examines white fox pelts at the Hudson's Bay Co.
Douglas, during his first voyage to North West America, observed at close range the appalling impact alcohol had on the indigenous tribes of the area. Rum had become the major currency and was the principle item which was bartered for furs. The Hudson’s Bay Company, which had a complete monopoly of the fur trade at the time of his visits, is stated to have used about fifty gallons of strong rum and brandy carried overland from the East which, when diluted, made up a quarter of a million gallons for a native population of some one hundred and twenty thousand. According to Douglas alcohol leads to mass addiction and the destruction of families, communities and the indigenous way of life. Many of the employees of the Company in North America pleaded with the authorities in London to cease trading in rum but such pleas went unheard. Later firearms were also used as barter. These proved equally destructive to the indigenous population. There appears to be no limit to the adverse effects which can be inspired by the profit motive and by human acquisitiveness. Man’s inhumanity to man is ubiquitous. Worse is man’s inhumanity to Nature for it will inevitably lead to Nemesis. 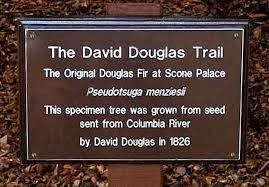 Douglas is mainly remembered as being the first person to introduce some of the great trees of North Western America to Europe They included the Douglas and Monterey pines, Sitka spruce, the various Sequoia and the Thuja or Red Cedar among others. Most have thrived in the British Isles and Europe, and some such the Sitka are now hugely important commercially and are widely grown in commercial forests in Europe.. A few, such as the sugar pine, have been less successful, and failed to survive the 19th century in this part of the world. 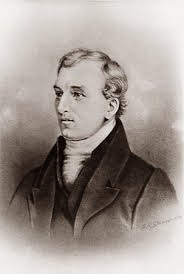 David Douglas spent about two and one half years in North Western America during his first visit. He returned to London to fame and claim having crossed Canada on foot or by canoe from the Columbia River in the West to Hudson Bay in the East where he arrived at the end of August 1827. It is extraordinary the hardship he and his companions endured during the four months trek of three thousand miles or more. One can only wonder how they could have survived with little equipment, poor clothing, an unreliable supply of food, some hostile inhabitants, and the extraordinary vagaries of the weather and the physical environment. In 1829 Douglas was again sent by the Royal Horticultural Society to the West where he arrived in California in 1840 after a further journey around the Horn. Here the Spanish were still in charge. It was a better settled and more southerly region than the Washington and Oregon areas and he suffered less hardship there. Although a Presbyterian, he received great kindness and assistance from the Spanish monks. Again he worried about the balance of Nature being destroyed because of the policies of the explorers and particularly of the Hudson Bay Company. The Company had a policy of clearing all the animals from the areas occupied by them, leaving large tracts bereft of indigenous fauna. He expressed his concern about the slaughter of the animals to a leading employee of the Company but he was vigorously confronted and advised to mind his own business. 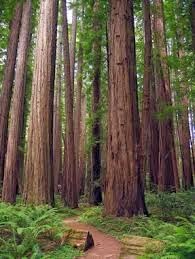 Douglas found new trees in California, including the Monterey Pine (Pinus radiata) and some of the giant sequoia. The Monterey had previously been described by Menzie but was first introduced to Europe by Douglas. He also found and introduced the big cone pine, Pinus coulteri. He went from California to Hawaii where he died at the age of 35 apparently having fallen into a cattle pit but there is considerable doubt about the exact cause of his death and there were persistent rumours of his being murdered. He had gone to Hawaii to continue his botanical studies and to climb and explore the islands’ great mountains and volcanoes. His death proved to be a major loss to Britain, Ireland and Europe, and a source of great regret to his many admirers in the world of botany and forestry. 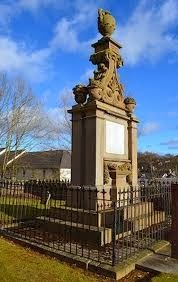 He is buried in Hawaii and there is a 23 foot memorial to him erected in the churchyard in Scone in Scotland where he was born. The memorial was provided by tree lovers, botanists and gardeners from many lands. His real memorial is to be found in the gardens, landscapes and forests worldwide. His contribution to forestry should not overshadow his seminal contribution to botany. He found hundreds of new species of shrubs and plants, nearly all of which reached Britain safely, thanks to his careful preparation of seeds and seedlings, and to his care in sending these by different routes to ensure that at least one sample would arrive safely in London or Glasgow. The biography lists a large number of the trees he introduced and some of the plants which adorn our gardens to-day. The great revival of interest in trees in Ireland at the beginning of the nineteenth century was shared by Britain which had also reached dangerous levels of deforestation. The turnabout was largely due to Douglas and the introduction of so many valuable trees of high quality timber which found a suitable environment in these islands and indeed in many other European, African and Australasian countries. Postscript (2014). The above review was written in 2004. Some of the Wellingtonias are now dead or nearly so, and the others are showing various degrees of distress. They lie in about two acres of ground in a building estate close to my house and it is likely that they are suffering from the effects of honey fungus, a slow invasive infection of the roots of trees which, because our failure to find a remedy of the disease, will inexorably lead to their final destruction.